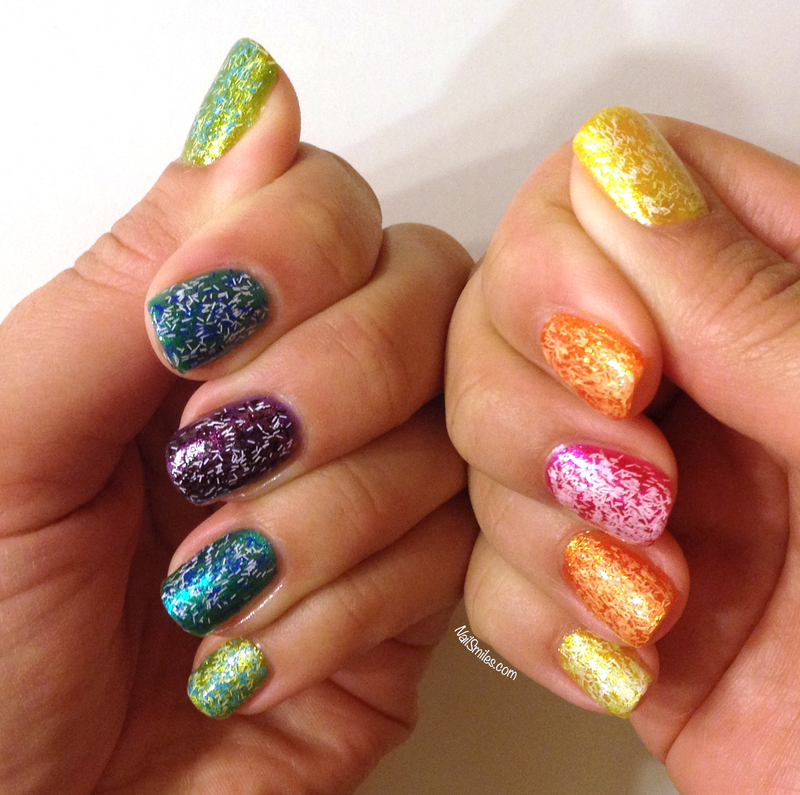 Rainbow Fuzzy Nails – Contest Winnings Arrived! 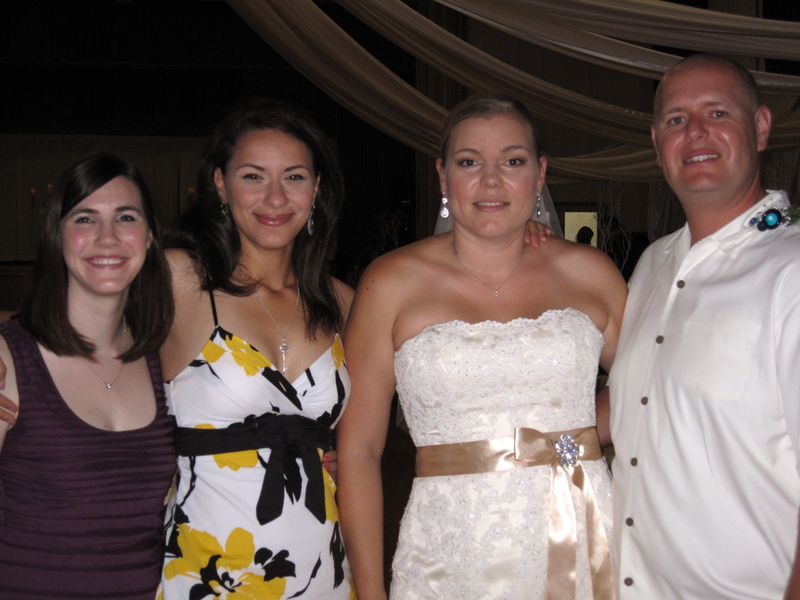 So, I’m a little back-logged on posts, but better late than never! A while back I did a small post about winning a contest from Janella at boldnbeautifulmakeup.blogspot.com. She did follow through on sending the prizes (all the way from Canada!) and I was so excited that I wanted to use most of the colors all in one mani. What does that mean? Rainbows of course! This was my last summer manicure before my Fall/Halloween transition (also look for a massive post coming up about Fall nails). For this manicure I used Color Club’s Take Wing as the base, two coats each, then coordinated the fuzzy coat colors on each finger. So long summer nails, welcome Fall! I couldn’t wait! 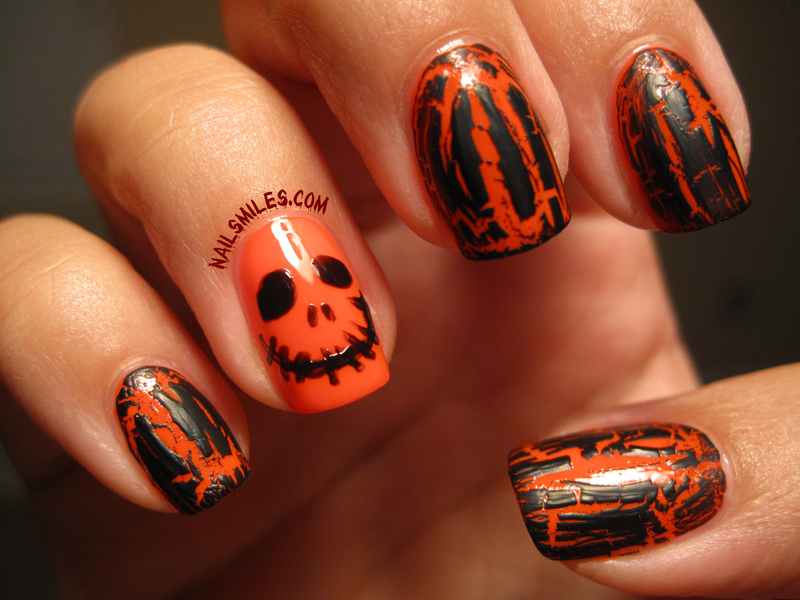 October 1st and I had to usher in Autumn and the month of Halloween with a neon orange and black crackle mani. I just wish the photo could show how neon the orange is, my fingers are almost glowing. I decorated my desk at work last week and my coworkers started asking if Halloween was my favorite holiday. It’s hard not to scream say YES! It’s a holiday where you get FREE candy, you get to dress up and not be considered crazy, and you get to worship Satan all in one…okay maybe not that last part. Anyway, this set didn’t actually take that long to do. 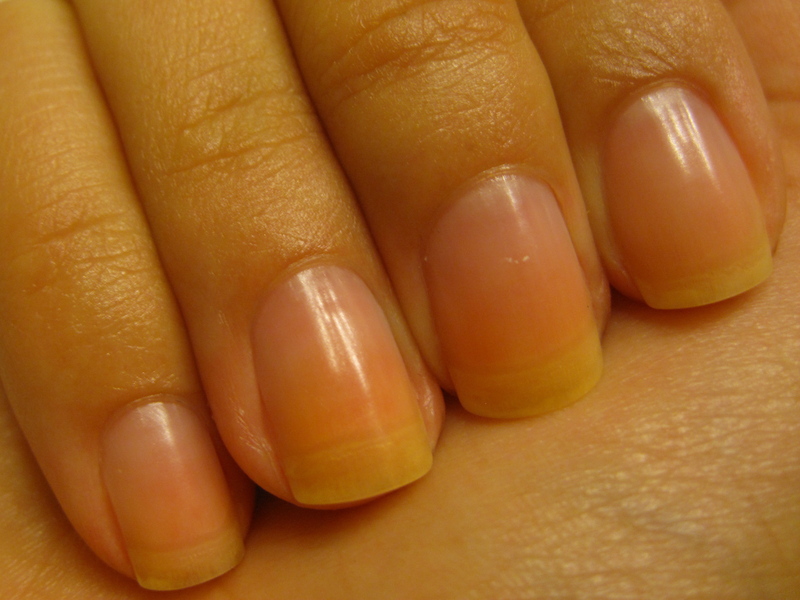 The orange Sinful Colors Summer Peach color dries very fast and is actually a matte polish. I put a fast dry top coat on the orange before applying the crackle; I don’t know if it allows the crackle spread better, but my theory is that it helps. 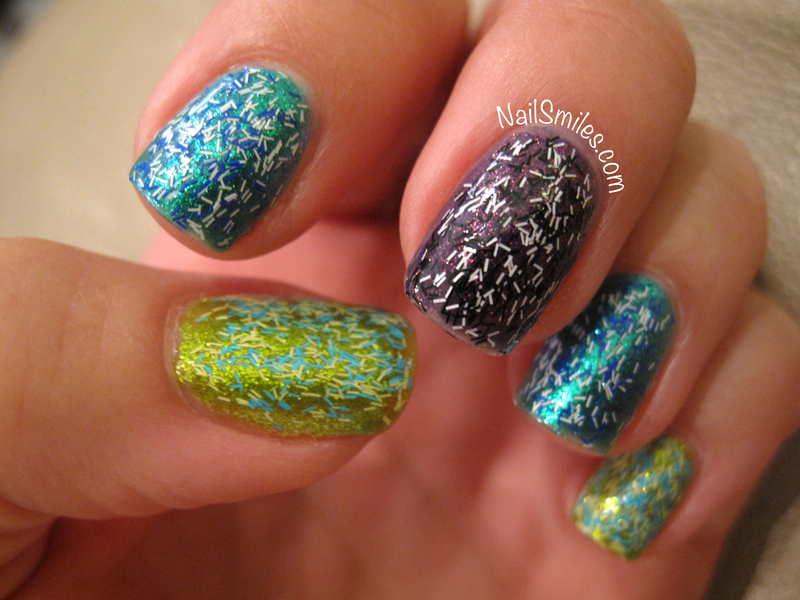 The crackle coat also dries super quick and is in between glossy and matte. 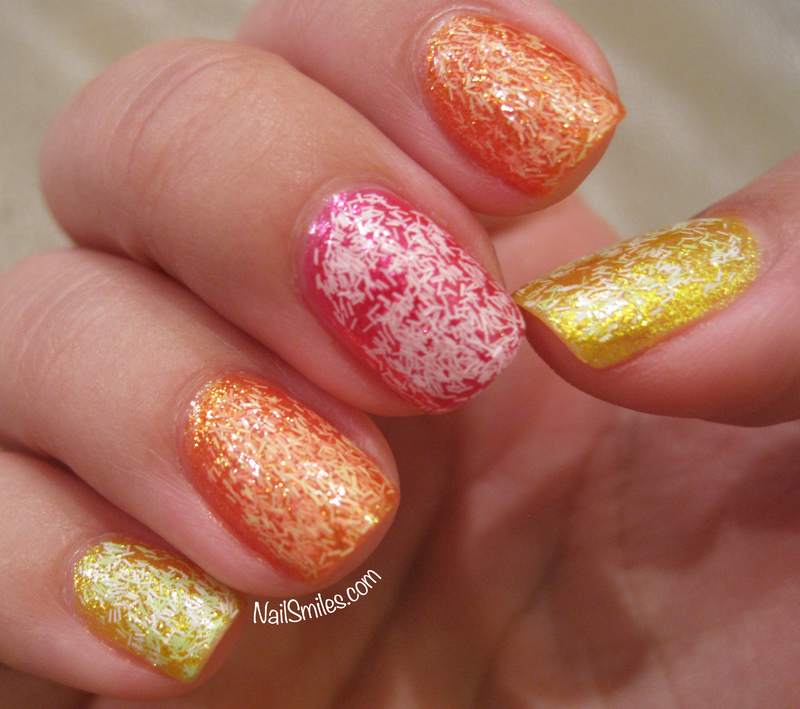 I did not apply a topcoat over the crackle. On the accent finger I just used a small paint brush to apply the design. 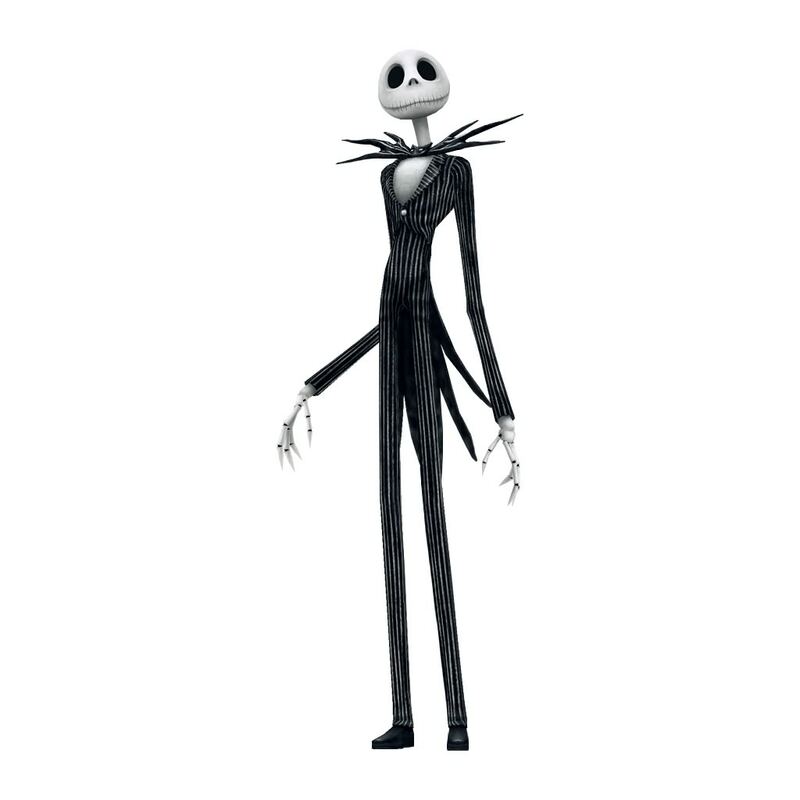 Yes, the face is inspired by one of my favorite movie protagonists, Jack Skellington (even though it’s on orange and not white). It is a cross between a jack-o-lantern and Jack Skellington and I’m quite pleased. 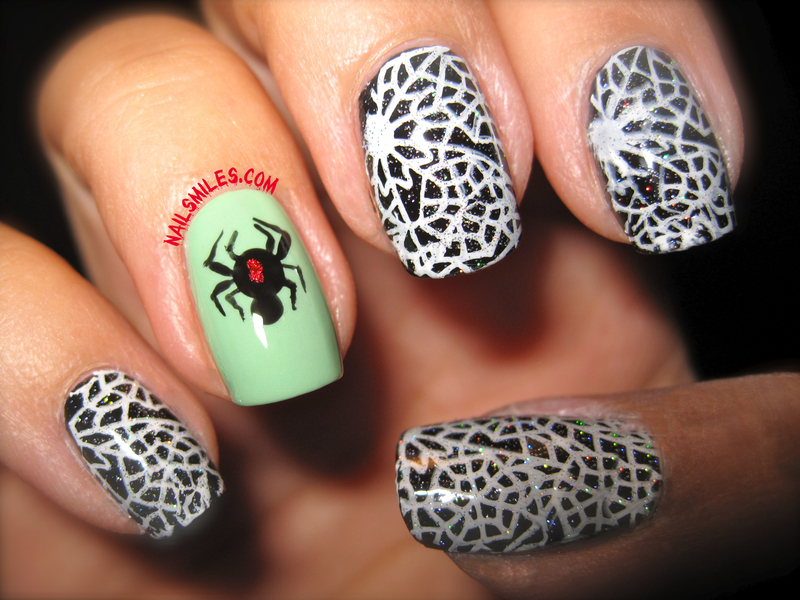 I can’t wait to do more themed nails this month!! In many cultures and civilizations there exist rights of passage where, upon completion, a member moves from one rank to another or is considered a more integral part of the group. I feel like in The Naildom (The Domain of Nails) having your first rage inducing hour-long session of removing glitter polish is a right of passage. The problem is I don’t think this is a right of passage anyone should really endure, no matter how masochistic one may be. I don’t think you need to have shreds of cotton balls stuck to all your sparkle coated fingers while you’re spewing profanities (totally not speaking from personal experience). I’m here to tell you there’s a better way. I’m here to help you transcend from your lowly nail scrubbing practice to the magical world of tinfoil finger hats (<—what?). Gather supplies – cotton balls or pads, tinfoil, scissors, polish remover (acetone works best, but is strong). Use scissors to cut tinfoil into 5 squares somewhere around 3×3″ – play around with the size that fits your fingers best. 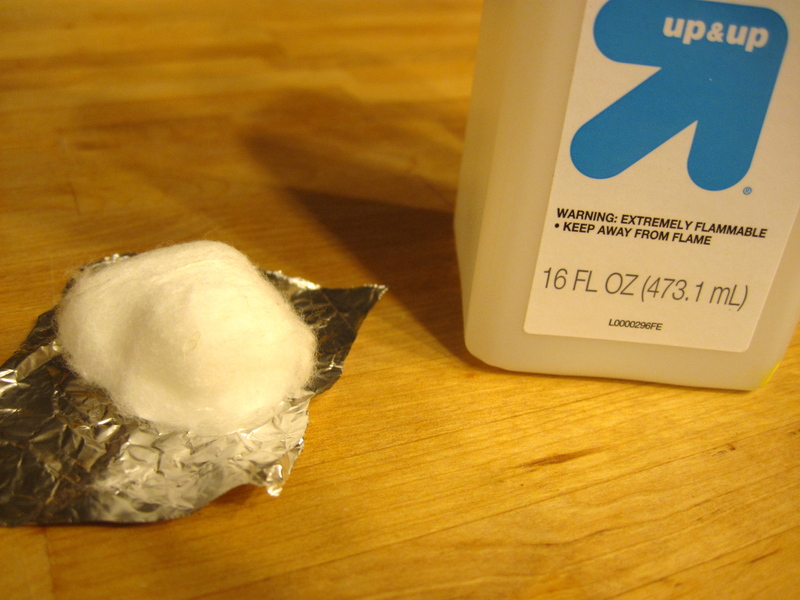 Put some polish remover on a cotton ball, place cotton ball on fingernail, then wrap tinfoil over fingertip and cotton ball together. Repeat with four other fingers and let sit for 2-3 minutes. I like to do one hand at a time, but you can do all 10 fingers at once if you have the skill. 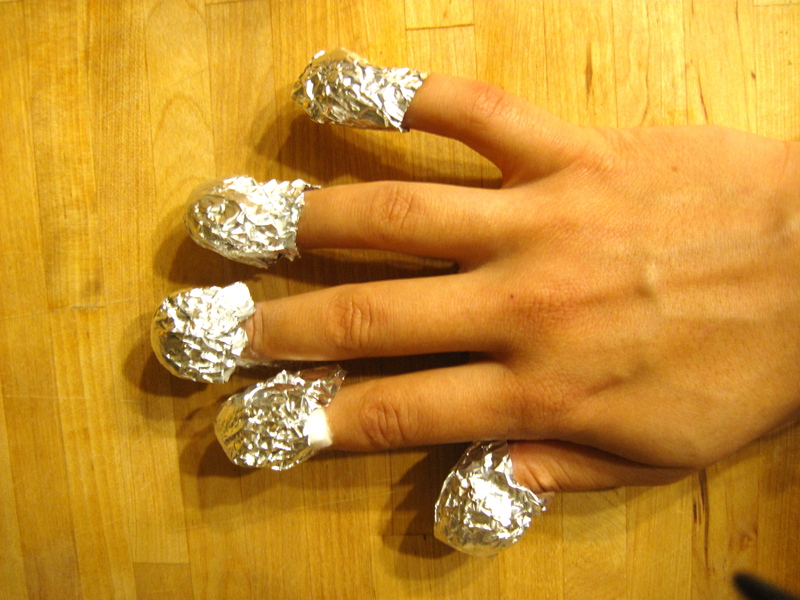 If you only do one hand at a time then you can reuse the foil and cotton balls on the opposite hand. 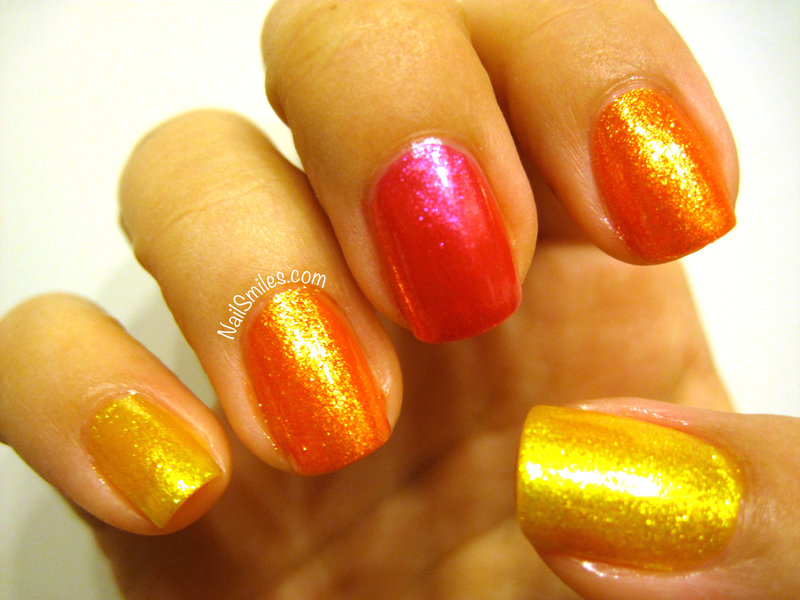 Remove the foil/cotton ball from each finger, then reuse the cotton balls to EASILY swipe of the softened glitter polish. I follow up this removal by scrubbing my hands/nails with a homemade coconut sugar scrub (mix sugar and coconut oil) which helps remove most of those leftover little glitter bits and also gives your nails/hands a punch of moisture and softness after soaking with the polish remover. Bask in the glory that you just took off your glitter polish in a few minutes versus a few hours. Happy Monday. I’m submitting this post a little out of order because after I wrote my draft I somehow didn’t save it properly so I have to reeeewwwrrrriiittteee it. Anyway, Arizona Iced Tea anyone? 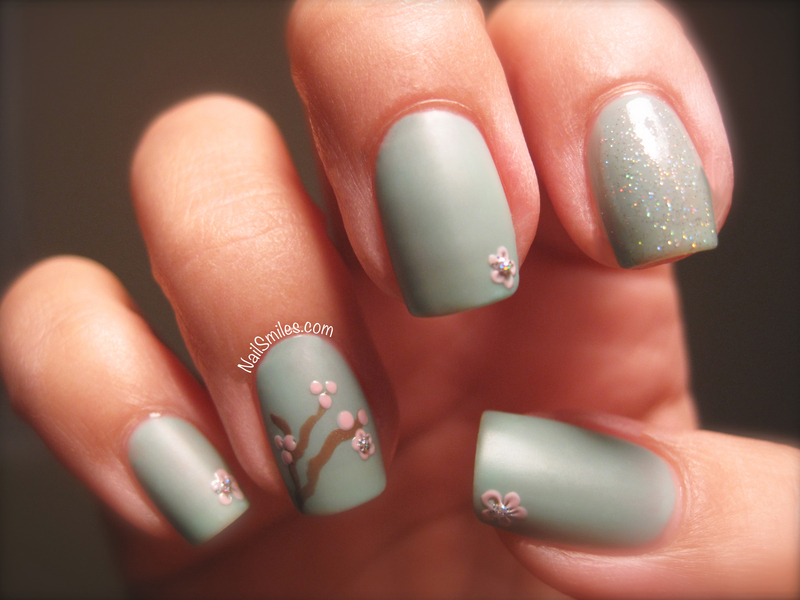 I can’t say this mani was inspired by the drink of my childhood, however, it definitely is reminiscent of their old can. I did also have someone tell me it reminded them of a porcelain teacup. This manicure was my first attempt at using a matte top coat as well as my first time using Sally Hansen’s Complete Salon Manicure line. I will say I now know why this line runs for around $8 versus the the $2-3 you’ll pay for their Xtremewear line. The brush is amazing! I had to do ZERO clean up on this manicure because I had so much control with the brush and polish. 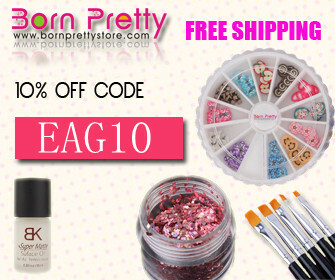 It’s very soft and it has a rounded shape that fit the curve of my cuticles perfectly. I was quite surprised at how thin one coat of the polish is…so surprised that I took a photo. 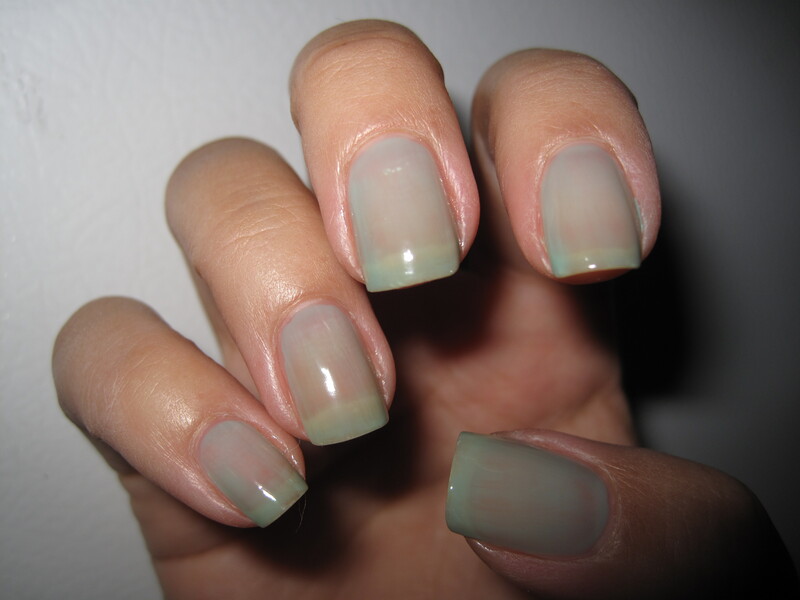 I used two coats, but really I think this polish would be best with 3 or 4 if you want full opacity. I definitely like the color of it too and I will say that these photos don’t do it justice (the pics look a little more grey and less green). The matte topcoat did what it said, it turned super shiny polish into a smooth flat matte finish. I did notice some micro bubbles and I’m not sure whether it was from the top coat or from not letting the colored polish below dry long enough. I was on the fence about matte manicures for a long time, but this experiment has definitely changed my mind and I look forward to playing with more options! The branches were just a simple few lines drawn with a fine paint brush and the flowers involved using one of my jenky homemade dotting tools (read: a sewing needle stuck into the pink eraser of a pencil). Place 5 dots of polish in a circle and then place the needle in the center of each circle and drag a line towards the center. This will create the look of dimensional petals. I put a dot of CG Fairy Dust in the center of each flower for extra pop. You can always use a different number of dots to get a variety of flower patterns. What are your favorite polish colors to make matte? So look at my freaking nails! This is three coats of each color. Basically I put gold at the base of each nail, then went back around and put green in the middle of each nail, then painted blue on the tip of each nail. Rinse and repeat two more times. These do not have a top coat currently, although I may add one on to see how it looks and to make the polish hold up. One of my friends all the way back from high school had her wedding reception this past weekend so I decided to do a simple white pearl manicure with heart accents to honor the festivities. I achieved the shimmery white by using one coat each of three different polishes listed below. 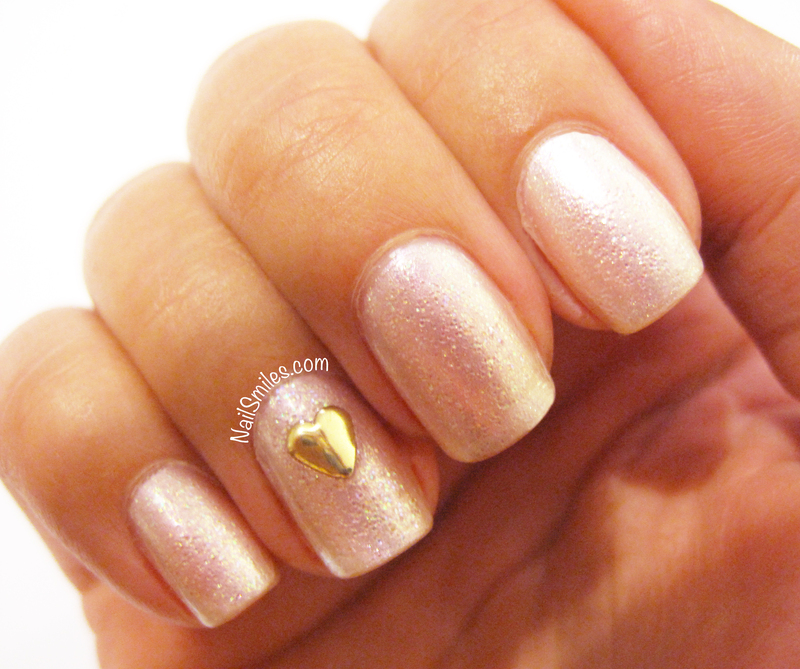 The adorable gold hearts are from the stud set I previously spoke about from BornPrettyStore.com. Halfway through the week I opted to refresh the manicure by painting different China Glaze polishes on each hand. 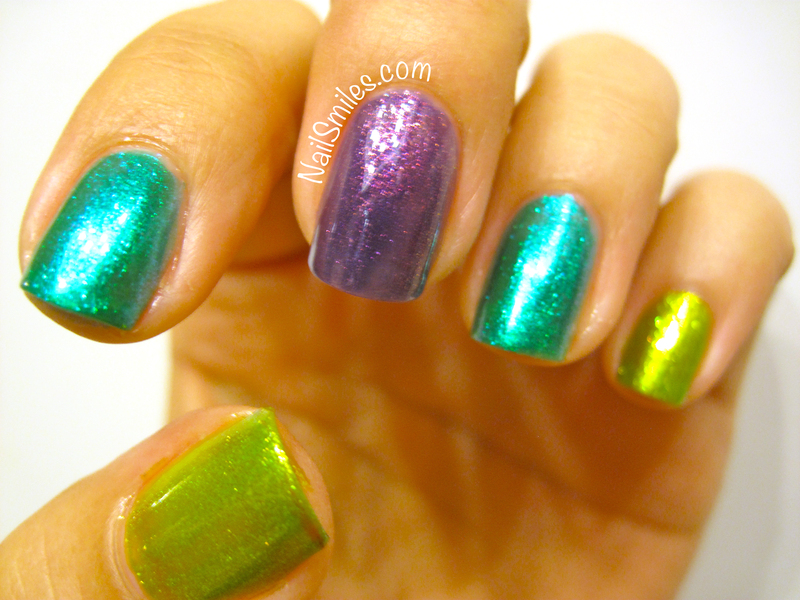 The left hand got two coats of CG Seashell while the right hand got two coats of CG’s Holographic Not in This Galaxy. I love how Seashell looks; it is painted over the white so I’m not sure how that influenced the color, but it’s a “just right” color for me….and it’s very shiny. The other CG polish has very fine holographic particles so it is quite subtle (not really noticeable indoors, sunlight really does the trick for this one). When inside, it looks more like a metallic polish, when outside you can see the full holo spectrum. I have to say the consistency of both these polishes was great (not thick) and the brush was high quality and thin for accurate application. Even though it’s September I feel like I have February Valentine nails going this week!